← Congratulations to Easypaisa on its 5th year Anniversary! Participants take part in the “Digital Financial Services: Where are we Headed?” panel at the 2014 GPF in Trinidad and Tobago. Key central bank governors from Africa, Latin America and the Asia Pacific recently shared their views on the role of digital financial services and financial inclusion. Africa continues to innovate in the area of digital financial inclusion, primarily via mobile-enabled electronic money services. Digital financial services have continued to dramatically expand both access as well as the range of options to further support not only for financial inclusion but economic growth opportunities as well. In addition to e-money being utilized as a money transfer service, it is now being used as the rails to increase access to a broader variety of financial services, from banking services such as deposits and loans to promoting payment opportunities for micro and small businesses to buy supplies and sell goods and services. However, the Governor also stressed the view that greater interoperability and interconnectivity between banks, payment providers and electronic money issuers will be important to continuously deepen access to financial services. Africa is also now witnessing several changes to the regulatory framework around e-money platforms, which are further supporting and strengthening their appeal. New regulatory developments in countries such as Tanzania and Rwanda as well as others in the region are helping to support and bring down the costs of cross border remittances via mobile-enabled e-money. In addition, as more customers store funds in their mobile-enabled e-money wallets, regulators are also taking notice to ensure that customers are both protected and provided with benefits that come with saving funds in the only manner some customers are able to in their countries via an e-money wallet. In particular, Kenya and Nigeria are planning to allow pass through deposit insurance for the holders of e-money trust accounts. Tanzania also has recently issued a circular that allows e-money issuers to distribute interest paid by banks on e-money trust accounts to the individual customers of these accounts. Santiago Peña, board member at Banco Central del Paraguay, discusses the future of digital financial services in developing regions around the globe. The scene across Latin America is also changing rapidly as regulators seek to balance both the protection of customers as well as support the expansion of responsible digital financial services. Paraguay has been the early leader in the region, notably in regard to the expansion of non-bank electronic money services and greater access to digital financial inclusion. Twenty percent of the population in Paraguay is now conducting mobile-enabled payment transactions and there are now more mobile-enabled e-money subscribers than bank accounts in the country. “Mobile-enabled electronic money accounts have had the greatest impact in the shortest period of time in terms of reaching the unbanked with a financial service that uniquely serves their needs,” said Santiago Peña, board member at Banco Central del Paraguay (BCP). But he also pointed out traditional banks now recognize the opportunity to make use of e-money services entering this market as well in the region. Other countries across Latin America are also quickly changing and adapting laws and regulations focused on increasing digital financial inclusion, most recently in Uruguay, Colombia, Peru and Bolivia. The recent financial inclusion law in Uruguay now requires that over the next four years all government agencies transition to making payments via e-money. To ensure broad-based access the law mandates these e-money accounts be free to open, not include maintenance fees, and have no minimum balance requirements. Colombia’s recent financial inclusion law further strengthens and expands digital financial access channels for all Colombians. The law allows for the establishment of new electronic deposit and payment entities which will be able to not only be able to offer e-money services popular in other countries but also treat these accounts as deposit accounts with providers allowed to pay interest, and to have these accounts covered under the national deposit insurance scheme. Peru has come up with well-defined regulations on e-money, which were adopted after AFI supported knowledge exchange visits to Africa and Asia. This has allowed the opening of the market to a broad range of both bank and non-bank financial institutions. One of the most exciting developments in Peru is the new approach to supporting interoperability and interconnectivity among multiple players and institutions under the Modelo Peru. This new initiative involves the establishment of a mobile payment ecosystem based on a shared e-money platform, which can be used by all parties, including: financial players (banks, savings and loans and microfinance institutions), mobile network operators and government entities. Mobile-enabled e-money services are also taking off in Bolivia with operators processing over USD 15.9 million from January 2013- March 2014. According to Bolivia’s central bank there are now more than 628,000 registered mobile-enabled e-money wallets in Bolivia. To wrap up his thoughts on the future of digital financial inclusion in Latin America, Board Member Peña also noted that the important thing moving forward is not more regulations but better regulations to support innovative financial services. Central Bank of Solomon Islands (CBSI) Governor Denton Rarawa. Collaborating and sharing with other regulators in similar environments. In particular, he highlighted how the Pacific Islands Regional Initiative provided useful support to other central banks in terms of sharing new regulatory practices and approaches to better enable digital financial inclusion. Continue to support financial education and client awareness of the responsible use of new digital financial service options. During both the forum and working group meeting, it was agreed that innovation is changing rapidly and regulators need to find a balance to both support new innovations as well as to ensure legal certainty for the private sector. Mr. Peña highlighted in his closing comments that it is the private sector, not the regulators who are closest to the market, “We do not have all the answers and we have to provide the rules for all the players but at the same time, we have to allow for innovation.”He stressed, however, that there is need for regulators to spend time in understanding the risks associated with new technologies. Financial inclusion is a huge challenge and it does require that regulators to both balance innovation with financial stability as well as to ensure consumer protection. At the same time, the regulators need to embrace new technologies and innovations and this can only be accomplished through public private sector dialogues. 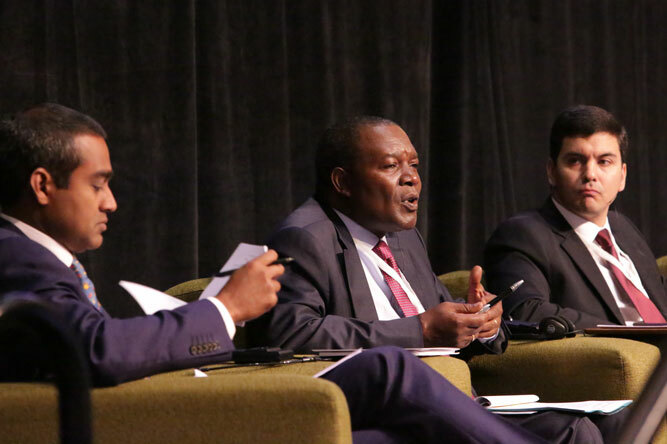 Central Bank of Kenya Governor Njuguna Ndung’u, center, takes part in the “Digital Financial Services: Where are we Headed?” panel at the 2014 GPF in Trinidad and Tobago. The 2014 Global Policy Forum (GPF) and the Digital Financial Services Working Group meeting held in Trinidad and Tobago in September gave many policymakers the opportunity to share various digital financial inclusion trends from several regions around the globe. This entry was posted in Alliance for Financial Inclusion, Mobile Money Regulations, Mobile Money Use Cases, Regulations and tagged Africa, Alliance for Financial Inclusion, Bolivia, Colombia, Kenya, Latin America, Mobile Financial Services, Pacific Islands, Paraguay, Peru, Rwanda, Solomon Islands, Uruguay. Bookmark the permalink. 1 Response to Digital Financial Services, Regulations and Financial Inclusion: Where Are We Headed?